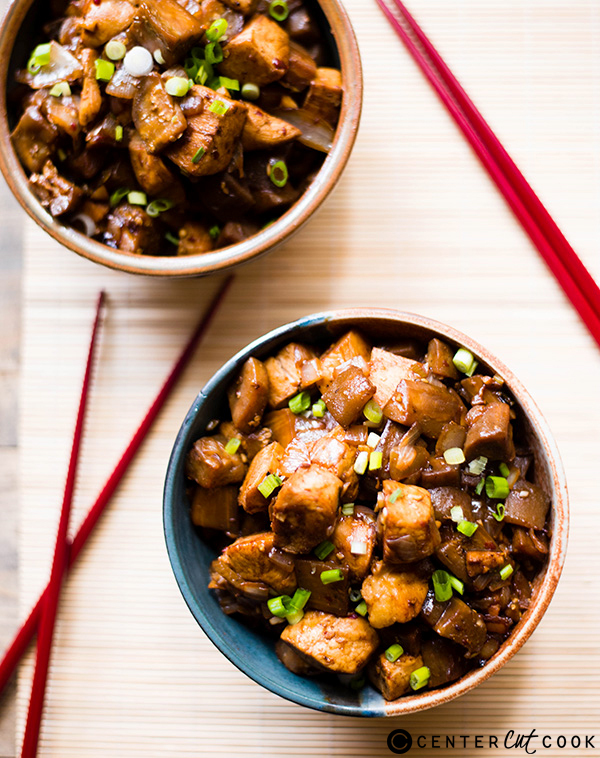 Make this flavorful, healthy, and delicious Spicy Chicken And Eggplant Stir Fry dinner in just 25 minutes! There’s something about fresh eggplant that I always seem to find difficult to be creative with. I stare and stare at it in the fridge, trying to decide how to prepare it. Sure, I have my go-to eggplant parmesan recipe, but I also like the idea of adding eggplant to another protein. Plus, that makes the meal more filling. So, I decided to try adding it to a stir fry with some chicken and other vibrant flavors. To start, you need to peel the eggplant because the skin isn’t very tender or tasty and can get cumbersome in a stir fry with little pieces everywhere. To peel it, you can use a vegetable peeler or a paring knife. I find a paring knife to be much easier and faster, but both are pretty easy. 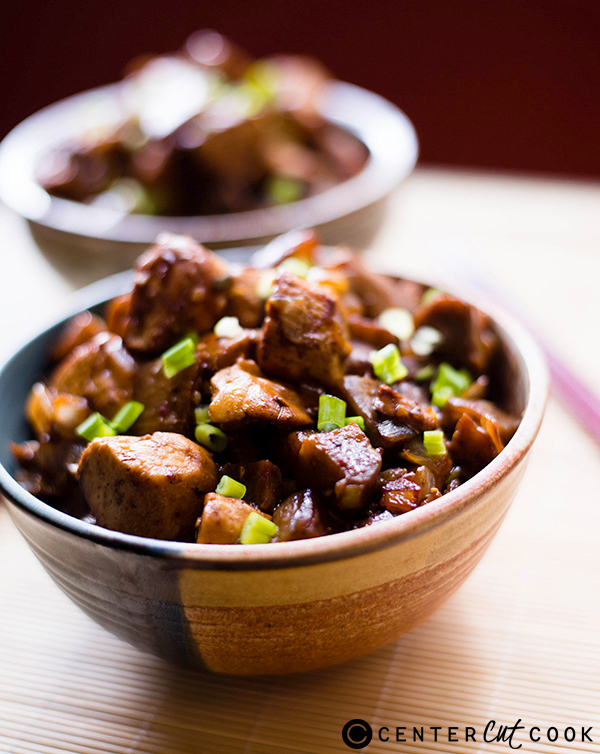 I also recommend you try to make the cubed eggplant and the chicken as evenly sized as possible – that way, you avoid overcooking some pieces to get everything cooked through or undercooking some pieces because almost everything else is cooked. To avoid overcooked chicken that is dry, you can also opt for boneless, skinless chicken thighs, though they have a higher fat content than chicken breast. Eggplant is best when it’s not cooked all the way to being mushy. Try to take it off the heat when it still has some give to it, but is mostly tender. You’ll avoid the bitterness of it being undercooked, but will enjoy it not being super mushy. 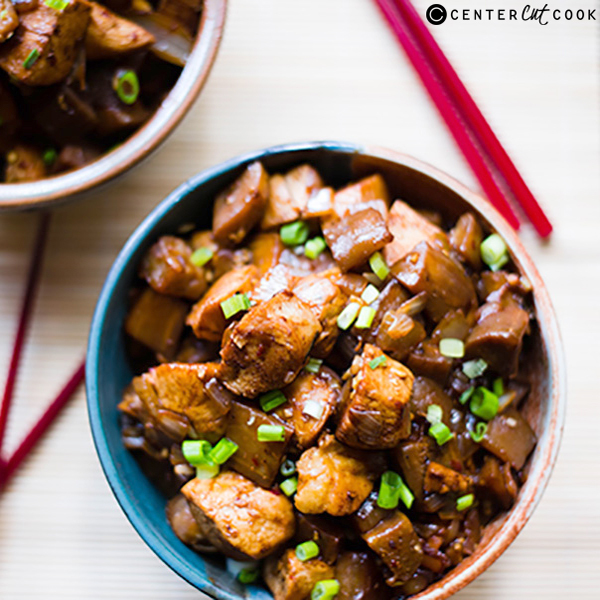 This spicy chicken and eggplant stir fry is a new go-to quick dinner and is a great way to use eggplant with another protein. In a small mixing bowl, combine the soy sauce, chicken broth/stock, rice wine vinegar, chili paste, cornstarch, and 1 tbsp. sesame oil. Mix well and then set aside. Heat the remaining 1 tbsp. sesame oil in large saute pan over medium-high heat. Add the chicken and onion and cook until the chicken is well-browned and the onion is tender, about 6-8 minutes. Add the eggplant and cook until eggplant is mostly tender but not yet cooked through, about 3-4 minutes. Add the garlic and green onions, and cook for 1 minute, until the garlic is fragrant. Add the prepared soy sauce mixture to the pan, cover, and then cook 5-6 minutes, or until the eggplant is tender and sauce is thickened.